Final Rejoice (Derrick's Story), choreographed and performed by Andy Jacobs. Twenty years ago, Abby Bender and Anna Luckey wanted to choreograph and dance on the Island. Limited time and money made the process of creating an event difficult, reminding them of their dormitory at Bard College, built on stilts over a ravine that would shake and rattle with a push or shove. “It was a wonderful thing, but potentially disastrous,” Ms. Bender told the Gazette in a 2016 interview. 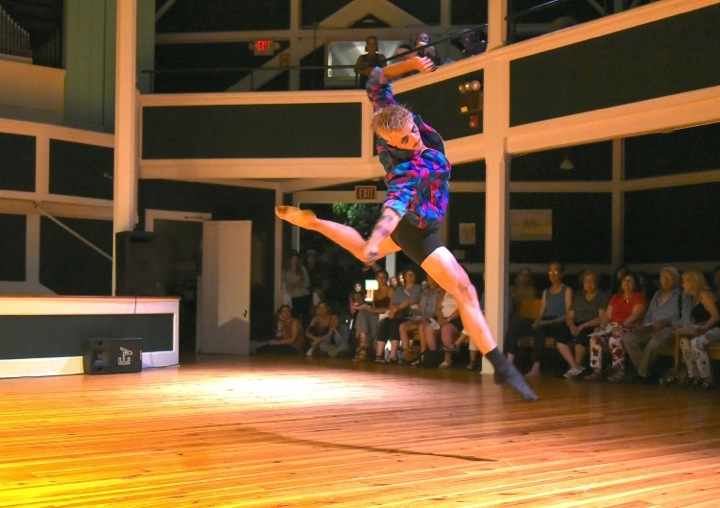 This weekend beneath the octagonal roof of the Union Chapel in Oak Bluffs, what began as a one-night creative dance festival called Built on Stilts opened its 20th season. And it was anything but disastrous. On Saturday night, in the third performance of eight staged over consecutive weekends, soloists, duets, trios and groups took the stage as an appreciative crowd waved away the heat and humidity with paper fans. Each night begins with a drum circle, but beyond that every night of Built on Stilts is different. Participants range in age from five to 80. In some performances the line between performer and audience blurs. Grace Hall and Megan Mendez , now 15, have been involved for 10 years. Both have been dancing since the age of three. Both started their Built on Stilts career in Stiltshop, the kids program. They opened the show with a duet, light and spirited. Grace is all about ballet and Megan loves modern; the two styles melded. Later the kids from Rise Vineyard Performing Arts performed a dance to a mash of Prince music, showing off acrobatics with cartwheels, handsprings and leaps, drawing the biggest applause of the night. But this was not a competition, rather an opportunity for dancers to celebrate their art. 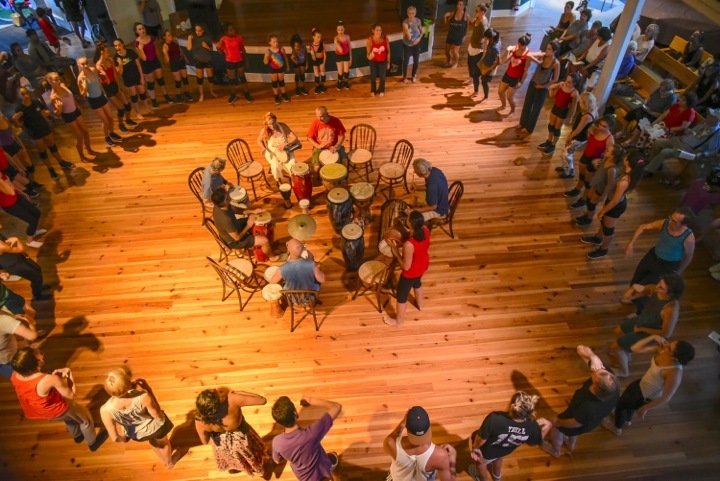 In Circlesong, Roberta Kirn led dancers and audience members in a vocal rhythm circle, creating an improvisational song. “I’m all about building a community through song,” Ms. Kirn said. People answered the call and stood to join her in song. With modern dance the dominant style, dancers explored emotions animalistic, experimental, grieving and humorous through movement. Two belly dancers were a whirl of color and a jingle of charms. 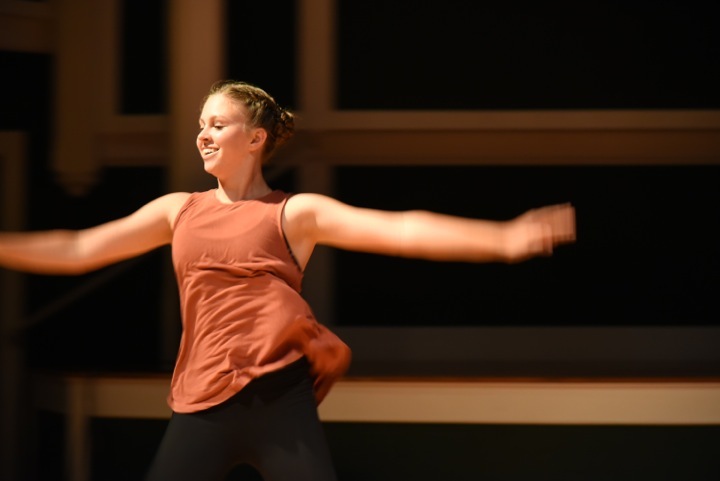 Through every performance, the pure joy of dancing was clear. The event’s longevity owes partly to the committed people involved, including stage manager Brent Alberghini, who has been with the show since its inception, and drum circle leader Scott Hershowicz, who has been involved since year one. In celebration of the 20th year, Ms. Bender showed a video at the beginning of the night. In it, one woman summed up the meaning of Built on Stilts. “Summer wouldn’t be summer without Built on Stilts,” she said. Built on Stilts continues next weekend with shows from August 20 to August 23 at the Union Chapel in Oak Bluffs. Admission is free. it's amazing to me how many people still have not ever been to Built on Stilts! GO GO GO! You're in for a treat! It was my honor to dance once again with Esther's Line Dancers and receive such a thrilling response from the audience! Can't wait to do it again next year. Hi Abby, Thanks for letting us know and our apologies. We've corrected the story.